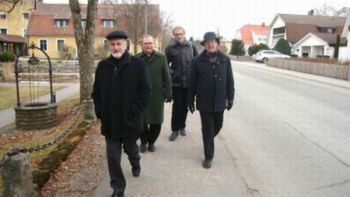 The commission for the dialogue between the Old Catholic Churches of the Union of Utrecht and the Church of Sweden met for the 12th and probably final time from 10 to 12 April 2013. Its annual meeting took place in Höör, a small town in southern Sweden. Höör is doubtless a very pleasant place to spend time in spring and summer, but while we were there the easterly wind was still wintry. Fortunately we were treated to warm hospitality for the meeting at the Stiftsgården Åkersberg and on our visit to Lund Cathedral, where we were welcomed by the priest and the dean. At the meeting the commission put the finishing touches to a document designed to be the basis for communion between the two Churches, subject to the agreement of all parties involved. The document is divided into chapters. It begins with a brief section on the background to the dialogue and how it came about. Next comes a description of each church: its historical development, its current church life, and its theology. Another chapter contains a joint statement on what the church is and how it works. The following chapter lists various questions that need further discussion, also in relation to other Churches which are engaged in dialogue with the Old Catholic Churches and the Church of Sweden. Finally, the document puts forward a list of recommendations. Before it is published, the document will be sent to the governing bodies of each Church. The commission hopes that it will be well received. The members now consider their work to be complete, and they thanked God for its fruits in the concluding prayers after the meeting.